Posted: April 7, 2015 Updated: July 21, 2017 by onlineph | Filed under Blogging, Government, Internet, Technology, Tutorials. Hassle over lining up early at NBI clearance kiosk? 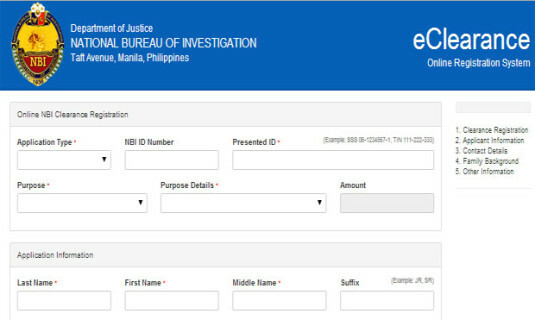 Recently, National Bureau of Investigation announced that application on their NBI clearance goes online. According to DOJ Secretary Leila de Lima that the system will continue to roll out and implement solutions. 1. 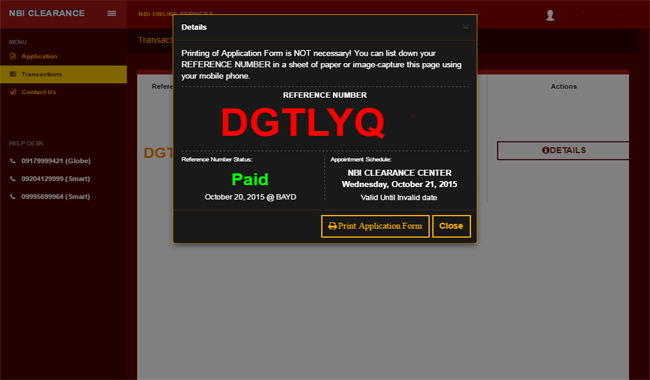 Visit NBI Clearance Online Application page through www.doj.gov.ph/nbi or www.nbi.gov.ph. 2. Fill-up the application form online. Kindly provide correct information such as contact details on the said form. Make sure that you have valid ID needed to present when claiming the clearance. 3. You will receive a confirmation email. Print out the said form with the assigned Registration Code. If you don’t have a printer, jot down the Registration code or save the file as PDF. 4. Visit the nearest NBI Clearance Center in your area. Just present your Registration Code and 2 valid IDs (original with your signature) and pay the corresponding clearance fee. 5. You may proceed to Online Application Counter area which will you take your picture and undergo fingerprint biometrics. 6. For those you got ‘No Hit’, proceed to Releasing Section, for the printing and issuance of your NBI clearance certificate. If you receive a “With Hit’ in your receipt, you will advised to come back on the release date. Then, proceed to Quality Control Section for interview, your clearance will be issued upon evaluation and cleared by the QC Interviewer. Here is the complete list of purpose and the corresponding fees that you would need to pay when obtaining your NBI clearance as of July 2017. When you acquire an NBI Clearance, you would be required to pay some fees. The amount that you would settle depends on the purpose of obtaining your clearance. As of present, NBI Clearance for Abroad Purposes and NBI Clearance for Local Purposes are two different things. Under those categories, there are also a lot of subcategories with slightly different fees. When applying for your NBI Clearance, make sure to state your specific purpose so your document would not be deemed invalid when you submit it as a requirement for whatever reason. Currently, there is a directive signed by Justice Secretary Vitaliano Aguirre II to make the NBI Clearance Multi-Purpose and make all fees standard, but as of the moment when you apply for a clearance, you would still be paying the above fees. Also do not forget, that you would be charged Php25 for e-payment services when applying for online registration. Some payment centers also charge different amount of service fee. According to my friends wala daw kwenta ang Online Application nila dahil same din na pag punta mo sa mga branches ay napakahaba ng mga pila almost the same sa old procedures. Tama ba? Anu pong experience nyo sa Online registration ng NBI maam?